Driven by a fixed view on what technology we want to implement could lead to a solution that is not effective and sustainable. Thinking technology first and pedagogy later may form a stifled perspective of what learners and educators actually need. Could a more holistic and modular approach help the co-designing of a teaching and learning solution? I like to think so. At the DMLL, I have drafted a layering approach in looking at learning needs and dynamics that will inform learning design and the relevant enabling technologies, forming part of the solution. This approach aligns with my views on a more trans-disciplinary approach in serious games production. This layering could be used as a discussion tool for a multi-disciplinary team. Taking game-based learning as an example (currently used to he lp language tutors at Coventry University to discretise requirements and specification for a pervasive learning approach), the layering illustrates a more modular and bottom up approach (layer 1 – layer 4) in looking at teaching and learning challenges/needs and formulating game design and the relevant technologies that would enable the teaching and learning process. 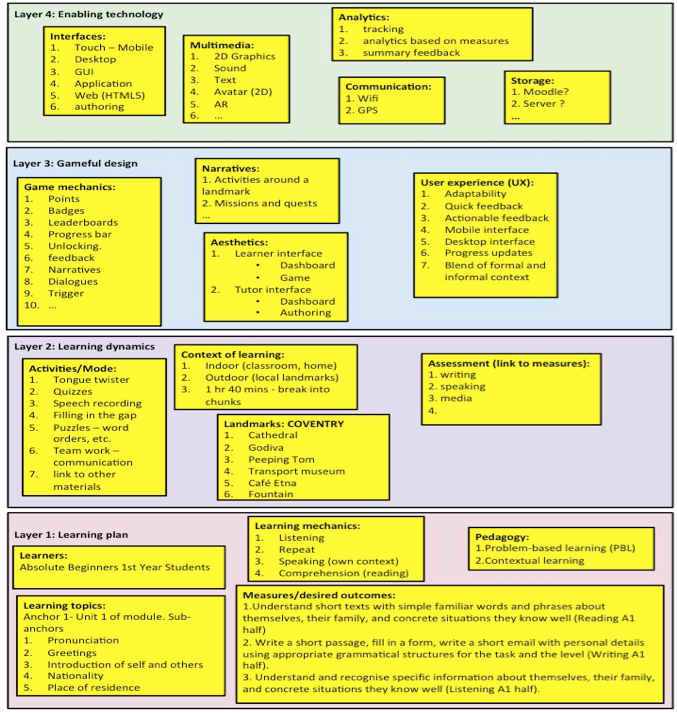 Before thinking about what the solution should be and what technologies could enable the process, it is important to pin down the learning objectives, learners and educators needs, what specific units/module breakdown, pedagogy (problem based learning, experiential, etc…?) and measurable outcomes. In Layer 1, a lesson plan taking into account all these variables is key to defining and understanding learning dynamics in layer 2. In terms of pervasive learning, where and what activities, mode of assessments, etc. Layers 1 and 2 help inform the specification of a lesson plan (s) with clear milestones that link to specific activities, location, assessment, etc. The milestones could be the specific objectives to be achieved for each unit of a module. Milestones can be associated to landmarks, where learning activities will be carried out, e.g. the Godiva Statue in Coventry can be a landmark where students can learn about ‘introducing oneself and one’s family’. Specific assessment approach can be designed – e.g. recording of a student’s introducing him/herself in a foreign language, writing simple text, conversing with Godiva, etc. Once the lesson plan is complete, a gamified approach (layer 3) can be designed to wrap around it, taking into account learner and educator’s needs, the activities and assessment (to inform feedback cycle). The mechanics, narratives and aesthetics can be specified. The learning dynamics, the learning objects that are key to supporting assessment, and the gamified design will help a design team to identify relevant technologies (layer 4) that enable and scaffold the learning process. A snapshot of a draft brainstorming is as illustrated below. The holistic model also serves as a way for us to research each layer in a more agile way, meaning studies of the requirements in each layer can collectively inform decisions made in a design and development process, towards implementing a technology-assisted and gamified teaching and learning.